3. Lowers your costs and improves your efficiency. A simple form organizes the highlights of your bid advertisement. Powerful document handling tools enable you to attach dozens of bid-packet documents with just one “click”. BidGetter™ includes features to automatically track visitors so you can notify them of addenda and pre-bid information. Use email – direct from the website or download an Excel listing and mail-merge to paper labels. 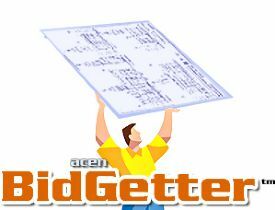 BidGetter™ lets you advertise your bid projects faster, wider and cheaper than any other method. And its inside YOUR WEBSITE. That means that your bid procurement expertise remains proprietary and your database of qualified contractors and suppliers will grow every time you bid a job.